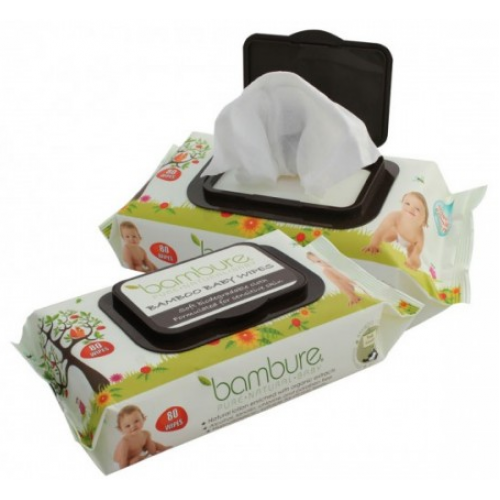 Bambure Bamboo Baby Wipes offer parents a natural option that won’t cost them the earth. Each wipe is moistened with organic aloe vera, tea tree extract and de-ionised water to cleanse and moisturise gently and naturally. They are free of alcohol, lanolin and perfume, all of which can irritate baby’s skin. They are also are free of parabens and other nasty preservatives. The wipes have a light lemon scent. Aqua (purified and de-ionized water), Glycerin, Sodium Benzoate, Tocopheryl Acetate (Vitamin E), Lavandula Augustifola Oil (Lavender Oil), Citric Acid, Tartaric Acid, Sodium Citrate, PEG-40 Hydrogenated Castor Oil, Potassium Sorbate, Citrus Medica Limonum Oil (Lemon Oil), Aloe Barbadensis (Aloe Vera)*, Tea Tree Extract, Chamomilla Recutita Flower Extract (Chamomile)*.